The Savannah River intersects the ICW at Elba Island. The ICW is a waterway constructed by joining existing rivers, creeks, and sounds with strategically placed cuts and canals. On the East Coast, the Atlantic ICW (AICWW) extends 1090 miles from Norfolk Virginia to Miami Florida. Originally built for commercial traffic, its primary purpose now is to provide a safe passageway for recreational boaters. Many “snow birds” travel the waterway seasonally on their way to more temperate waters as the season dictates. ICW traffic going north immediately enters South Carolina after traversing the Savannah River and travels past Daufuskie and Hilton Head. 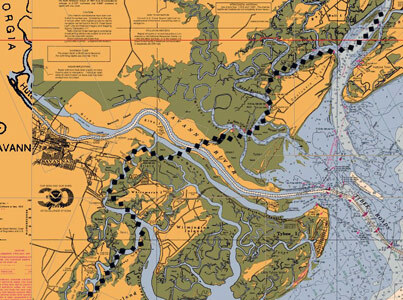 Southbound boaters will connect with the Wilmington River and journey past Causton Bluff, Thunderbolt, and Skidaway starting their voyage down the Georgia coast. Unwary travelers are sometimes confused by the two intersecting buoyage systems. The ICW lateral markers show red on the right and green on the left when traveling south through this area, while the seaward system of buoys used on the Savannah (and other sea-ward rivers), maintains a “red-right-returning from sea” convention. One such intersection occurs when the ICW leaves the Wilmington River and enters the Skidaway River. Those continuing down the Wilmington will leave the ICW red markers on their right and suddenly encounter green markers on their right as they travel to the sea. ICW markers actually have a small yellow triangle or rectangle to further identify them, but these are hard to see, unless one is looking carefully. Local boaters enjoy over 420 miles of tidal creeks and rivers, just in Chatham County alone. Learning to boat here requires a solid foundation in navigation, an understanding of tides and currents, and good boat-handling skills. Tides normally range from 6 to 9 feet, currents often exceed three knots, and creeks serpentine and interconnect through monoculture marshes. But for those who can master the fundamentals, the joys far outweigh the negatives.